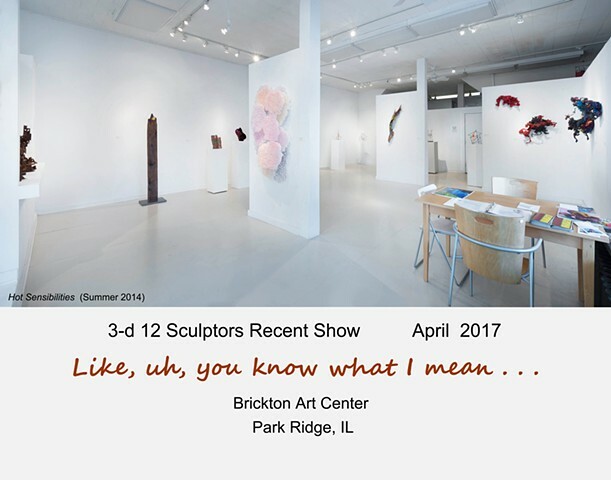 3-D 12 is a Chicago-based sculptor group committed to building a strong collective identity while projecting distinctive individuality in thematic exhibitions and community projects. The exploration of current global issues coupled with critiquing relevant work is intended to connect artist to social responsibility. Members' personal perceptions on art and societal issues cover as broad a range as their materials of choice. Decomposed found objects, recycled plastic and metal, salvaged wood, earth and water, steel and bronze are some resources members effectively reconfigure in order to translate ideas into physical forms. The sculptural works acquire subjective and shared meaning, forming genuine meta-landscapes.